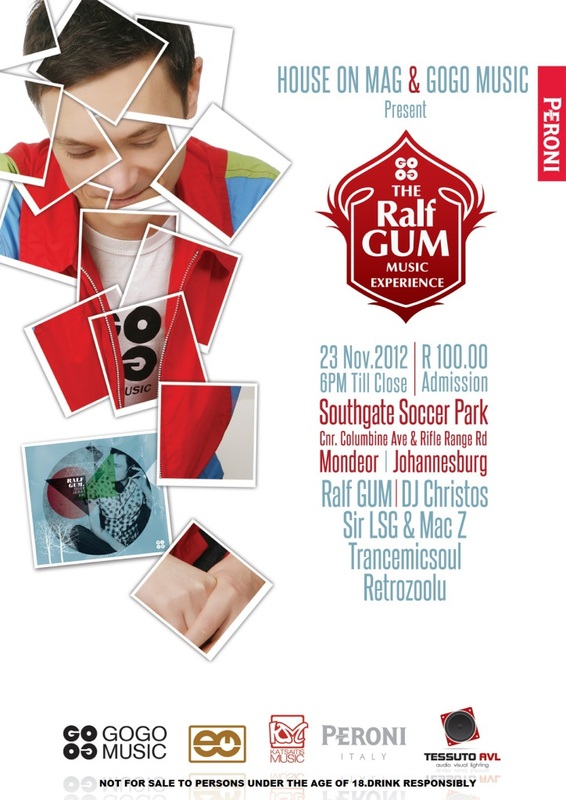 Houseonmag & GOGO Music Present The Ralf GUM Music Experience, powered by Tessuto AVL and Styled & Refreshed by Peroni. The Ralf GUM Music Experience aims not only to celebrate and launch the latest offering from the German tastemaker titled “Never Leaves You” – however it also aims to present a holistic GOGO Music Experience. Urban House patrons will see Ralf GUM and the local House music heavywieghts Christos (Metro FM), Transmicsoul, Retro_Zoolu Sir LSG, and live on the Saxophone Mac Z, take to the decks (as musicians/producers who’ve released under Ralf GUM’s historic and world renowned record label GOGO Music). Make sure you get yourself an original copy of “Ralf GUM – Never Leaves You” now in stores in South Africa. Worldwide out on GOGO Music and in shops. VENUE: Southgate Soccer Park, Cnr Colombine Avenue & Rifle Range Road, Mondeor, Johannesburg.